Celtic Daggers for sale are 21 inches in all. 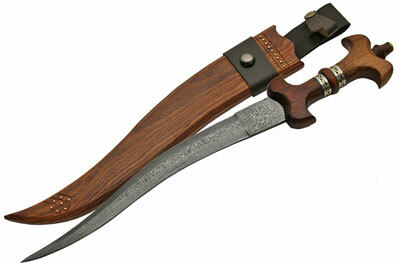 These daggers feature a beautiful design combining rosewood and Damascus steel. The 15 inch blade features the distinctive Damascus flowing wave-like pattern. The steel blade is offset by the gorgeous rosewood handle which features steel and brass spacers. 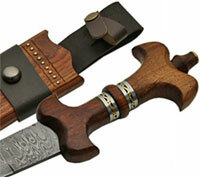 The custom wooden scabbard has a brown leather belt loop. Buy these popular Celtic Daggers for only $99.99.